Sari Schorr Never says Never as the Show goes on tonight at The Muni, Pontypridd. Friday night and there is a surfeit of live music that will capture the ears of many. So much choice, the valleys and cities are alive with music to entertain. They all need your support to keep these venues open and giving us choice and diversity of sounds. 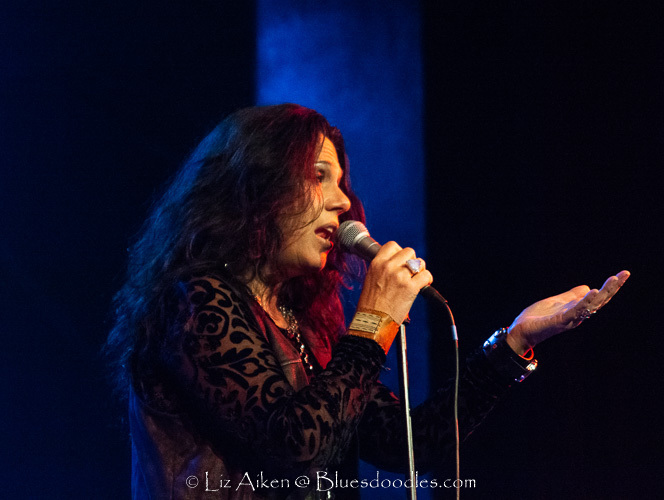 With a new album out Bluesdoodles opted for Sari Schorr and her band tonight. Getting tonight’s music underway, local young band Hang 11 stepped onto the stage. This young band blends blues, funk and rock as they continue to build a following across South Wales. The trio is fronted by guitarist Brad Dickenson with the rhythm section comprising Anwen Francis on drums and bassist Josh Evans. Opening with some funky sounds that promised that this would be blues with a twist, I would have liked to have heard more of this funky vibe than some of the tired oft-played covers that they included in the set. Hang 11 are still developing their style and approach and have the promise of being a blues band that will connect and hopefully bring in younger audiences. Brad is a confident frontman, and his guitar playing certainly warmed the venue and got the feet tapping before the main event of the evening Sari Schorr. Tonight, on what should have been her Never Say Never tour, due to delays the album now is not out officially until 5th October, those of us who were at the venue had the opportunity after the show to purchase a signed copy. That was one of the bonuses the other was to spend over 90 minutes in the presence of her wonderful voice and the skills of the musicians around her. Joining Sari on stage were Ash Wilson on guitar; Bob Fridzema on Hammond organ and a rhythm section of bassist Matt Beable and Roy Martin on drums. What a plethora of skills and they delivered a set list of favourites from Force Of Nature and the chance to hear songs from her new album Never Say Never live for the first time. Opening with New Revolution we heard Sari’s voice soar across the venue, an excellent choice as it is a number that showcases Ash’s superb guitar playing as he opens the number whilst the band creates a bluesy celebration of the legacy and the man Martin Luther King Jr. This is a ballad plus, with the Hammond and guitar combining to increase the emotions that Sari vocally explores. Other highlights ( though in reality every note played and sung tonight was something special and felt very personal) from the wonderful new album showcased tonight the tribute to Robert Johnson with King of Rock and Roll will certainly be a crowd pleaser; with a band in harmony, this will become a set favourite. Why? Simply what a band! Sari’s rendition of Ready For Love was nothing short of sensational. This well-known Bad Company number was given an extra spark tonight. Sari’s sensual vocals are perfect for the song especially when combined with a clever instrumental delivery of piano and guitar. Once again Ash and Bob are working together creating a wall of sound for Sari to leap from. The title number was sensitively and beautifully delivered; a song was written by Ian McLagan after his wife died which adds another layer of emotional depth. Many of Sari’s songs reflect her experiences and life’s journey. Valentina her alto ego is an infectious uplifting number with a scintillating guitar solo that holds everyone’s attention in the audience. From her previous album Force of Nature, she plucked songs that naturally feel into the mix from her latest. Demolition Man with the Hammond rising and falling with the sound of Sari’s voice, this favourite sounded even more majestic with her new line-up and has grown into a number that is an absolute joy to listen to. The song that relates back to the time she was living in Paris scratching around for money coffee and a croissant, but without this experience she wouldn’t have written this song, Ain’t Got No Money. Sari belts this out and brings me out in musically fuelled goose-bumps. She smiles with love as she talks about her three beloved Pitbulls back home in New York and the inspiration for Kiss Me. Bands that surround singers often come and go, personnel change. Sari has surrounded herself by musicians that understand the music she wants the audience to hear. Tonight we saw a band that was at ease with itself, playing music that they all want to play. The Backing vocals from Matt, Ash and Bob were superb, adding that extra kick to the lyrics underlining and re-enforcing the emotional integrity to the music. All too soon the band were leaving the stage. The encore opened with Sari’s unique reinterpretation of Black Betty and then Aunt Hazel. Two songs that have a connection they are women, madness and addiction, the trials of life and what it can drive an individual to. What a powerful close to a night that was an emotional journey that left us all with joy in our hearts and souls. The performance tonight was from a vocalist that sings with ease and an assured stage presence as Sari makes the audience part of the show with her warmth. They take the whole event to another level, with wonderful interplay between all musicians on stage. This is music that feeds your soul with the lyrics and the attention-grabbing manipulation of the notes and rhythms. The layered tones and textures of sound are mesmerizing and leave you replete with the sound of stupendous playing of Blues tinged with Rock ‘n Roll fun.